Western Australia’s Coral Bay is one of those places that you just need to visit. With its spectacular turquoise coloured water and fantastic white beaches, we bunked there for a few days in a great park directly opposite the beach. We had heard the park was a popular one and it was very true. It wasn’t even tourist season when we visited and the park was already well over 50% capacity. There was one particular reason we were looking forward to our stay here as we longed to snorkel with manta rays. What an absolute buzz this turned out to be. Luckily for us, these guys don’t have stinging barbs and are completely harmless…but they sure are big! Booking our trip with Coral Bay Eco Tours, it was pretty well a full day trip which took us to the inner reef where we were able to first snorkel on a coral reef to hone our skills before swimming with the “main attractions”. 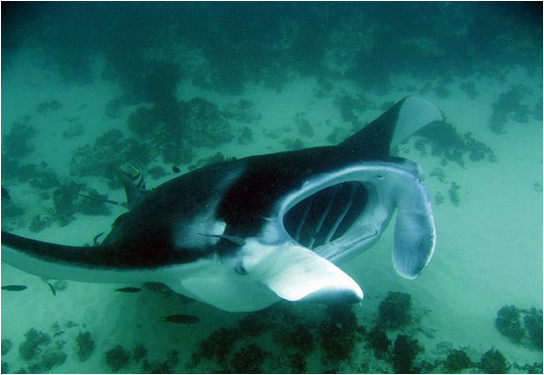 To assist in locating the manta rays, spotter planes are sent up to locate them, and then once spotted, the boat steams forward towards the manta ray’s location. Frantically, it’s then “go, go, go” as the snorkellers jump into the water, and before you know it, the manta ray is swimming below you, only a couple of metres away at the most. What an incredible sight! The experience was amazing…seeing these graceful animals often with around a 4 metre wing span doing “loop the loops” below you as they swim and feed, filtering the plankton with their mouth open (which alone was almost 1 metre wide)! Seeming quite relaxed with our presence, we were lucky enough to do numerous swims with these fantastic creatures during the day, and felt very privileged to be able to swim with them in their natural environment. Our next stop, Exmouth, was another we were both looking forward to. 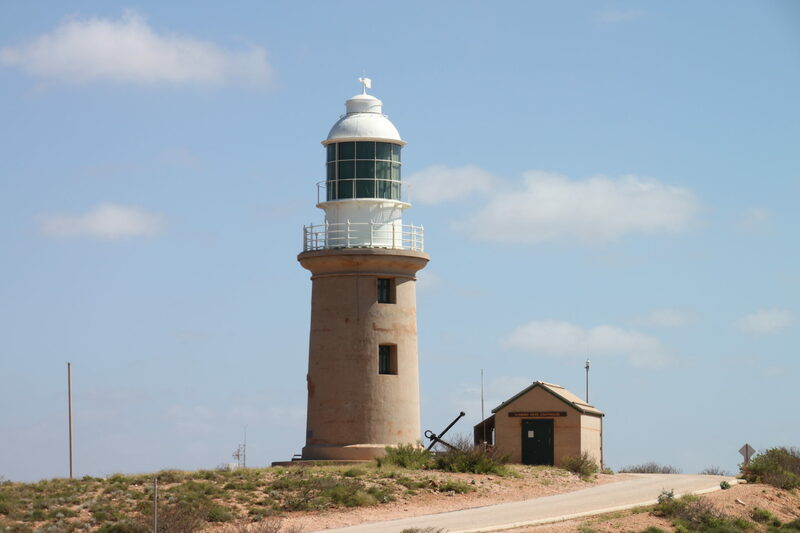 Originally set up in the 1960’s as a communication station for the US, the town is now more famous for the Ningaloo reef which covers much of its coastline and goes all the way south to Coral Bay as part of the Cape Range National Park. Basing ourselves here for a few days, we checked out the marina, visited the Mildura shipwreck which can be seen from the beach, and visited the now defunct Vlaming Head Lighthouse. 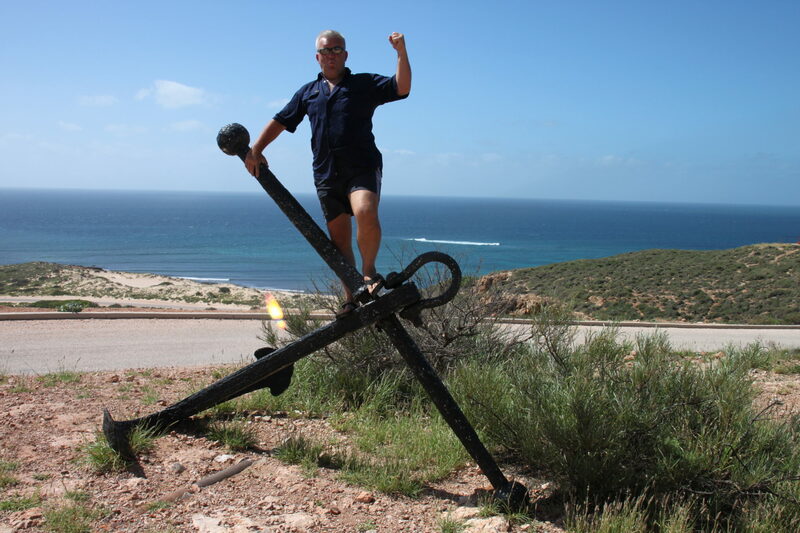 But we knew there was much more to be seen in Exmouth by visiting Ningaloo Reef from the Cape Range National Park. We decided to head down there for a couple of nights camping, and had no troubles getting in to the Lakeside campsite to set up camp. Lakeside is right next to the beach and has a tidal lake adjacent to the beach with around 8 campsites. Being rather busy with other campers when we arrived, we backed in and went about setting up. But it wasn’t long before we realised there was an issue….the high tide was extraordinarily high and it was obvious the lake was starting to overflow and fill up the car park, with water coming closer to the campsites very quickly! Becoming a little anxious, we watched the water come very close before receding. Finding out later in the afternoon that the tide was the highest all year (1.8m), we don’t think we would have stayed if we had known otherwise. The ranger visited later that day to indicate that the tide the following day would be larger again (1.9m), so the camp area was now closed and we needed to vacate in the morning before the next high tide. Not to miss a good opportunity before having to move, we took our snorkelling gear down to the beach and swam out to the reef which that beach is renowned for. Using the current, we observed a lot of coral, fish and a few stingrays before coming back to shore. Before leaving the National Park, we recommend taking a boat tour along Yardie Creek Gorge as we found this tour absolutely fantastic. We spotted a few rock wallabies during our tour and their rock hopping on the huge gorge walls was great to watch. Leaving the National Park, there was one important date we had back in Exmouth which I had been looking forward to for sooooooo long….we were going to swim with the whale sharks!! Telling both parents that’s what we had planned to do raised all sorts of comments, such as “you’re crazy”! 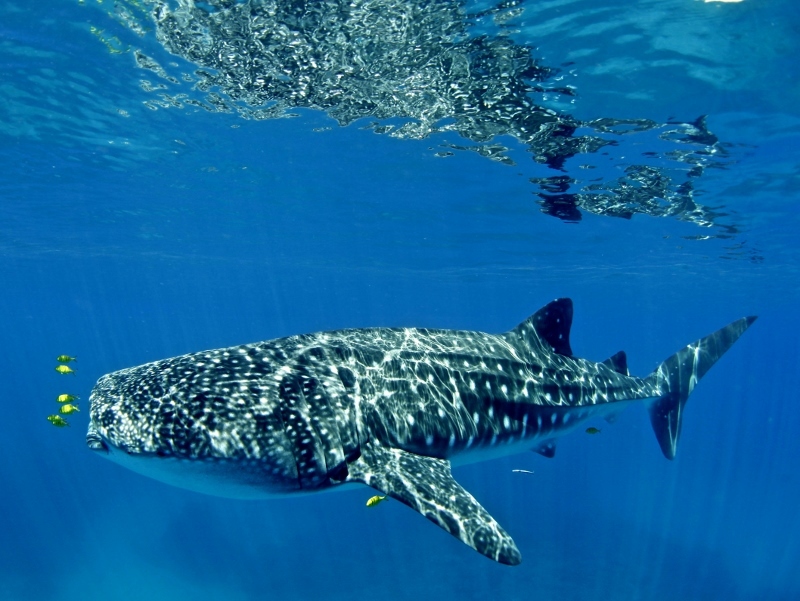 Growing up to 15 metres in length, swimming with whale sharks had been high on my bucket list for a few years. What a sensational tour! We managed to swim with 4 sharks, the last being around 8m in length. Trying to describe how good it was to swim alongside an animal of this size in its own habitat (and it not try to eat you!!) was the opportunity of a lifetime. So we think this part of Western Australia’s coastline is one not to be missed, and we definitely can’t wait to go back.